The effect of local anesthetic applications to trocar sites on postoperative pain control has been studied many times, and different results have been obtained. We planned a controlled study evaluating the effect of bupivacaine administration and other contributing factors on postoperative pain following sleeve gastrectomy. 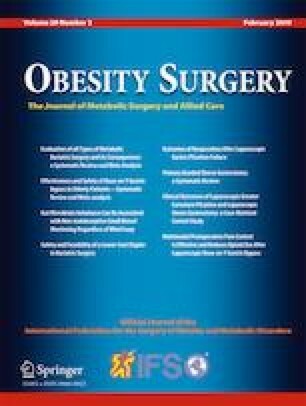 Patients who underwent laparoscopic sleeve gastrectomy were included in the study. Patients were randomized into two groups according to local application as either a local or non-local group. Also, the patients were grouped separately from local group allocation according to time to first passage of flatus (< 12 h, ≥ 12 h) and duration of surgery (> 50 min, ≤ 50 min). A visual analogue scale (VAS) was performed at 4, 8, 12, 24, and 48 h postoperatively. Opioid analgesics (pethidine HCl) were administered if the patient’s VAS score was greater than 5. Demographic characteristics, such as age, gender, height, weight, body mass index (BMI), and operative time, were recorded. Demographic characteristics and VAS scores were compared between groups. A total of 168 patients were included in the study. Of these, 84 patients were included in both of the local and non-local groups. The demographic characteristics between groups were similar. There was no significant difference between groups in terms of VAS scores (p > 0.05). In the analysis according to the time to first passage of flatus, the 48th-hour VAS scores were lower in the early flatus group (p = 0.036). According to the duration of surgery, first flatus was detected earlier, and VAS scores at the 8th and 12th hours were less in the short operation group (p < 0.001, p = 0.005, p = 0.031, respectively). Although we did not show any effect of local administration of bupivacaine in LSG on pain, we concluded that other factors like duration of surgery and first flatus time have an impact on this issue. Ethics committee approval was obtained for this study. Informed consent was obtained from the patients. El Hachem L, Small E, Chung P, Moshier EL, Friedman K, Fenske SS, Gretz HF 3rd. Randomized controlled double-blind trial of transversus abdominis plane block versus trocar site infiltration in gynecologic laparoscopy. Am J Obstet Gynecol. 2015 212(2):182.e1–9. doi: https://doi.org/10.1016/j.ajog.2014.07.049.